One of the missions in Legacy of the Void’s campaign is on a forest moon called “Endion” and it involves shield generators and orbital battle stations. Sounds familiar? It’s also a game made by Blizzard, and they love hiding easter eggs everywhere, so Ewoks from Return of the Jedi just fit perfectly. 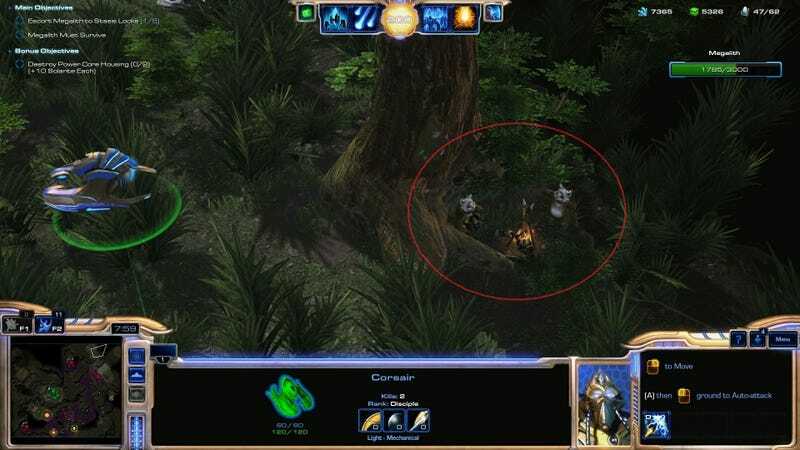 Pointed out by sinister_shoggoth on r/starcraft, they’re all over the map (It’s the one called “Unsealing the Past”), hiding behind trees and remote places. Very cute. Trying not to spoil the campaign, lets just say the fate of these Ewoks here is somewhat... darker, compared to Star Wars. But I’m pretty sure even with wooden sticks they could deal with Ultralisks or Hybrids easily. There’s also a special someone hidden on the same map from Jurassic World. It’s a busy forest.